Canuck Quilter: In stores October 2nd! I was going to share one or two projects in progress today but there were pretty pictures in my email inbox that I just couldn't wait to share. 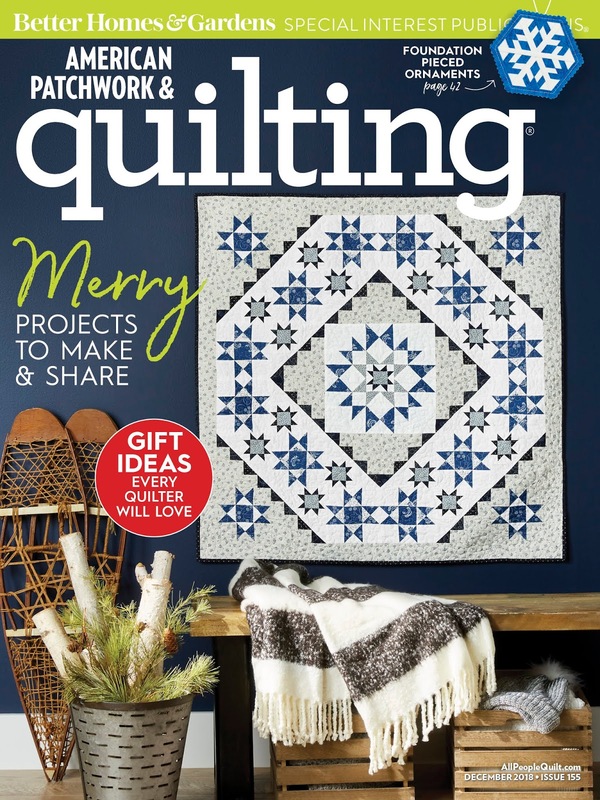 See what's in the December 2018 issue of American Patchwork and Quilting magazine? Used with permission from American Patchwork and Quilting magazine. (c)2018 Meredith Corporation. All rights reserved. Look familiar? 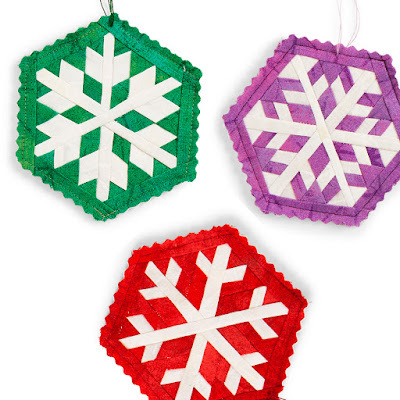 These smaller cousins of my 9" snowflake blocks measure 4 1/4" across from corner to corner. I pinked the edges instead of trying to bind such a small piece. That gives a much tidier (and faster!) finish than I could manage with binding on such a small piece. The project made the cover, too! Look way up in the top right corner. The magazine's tester, Monique Jacobs, used Seeing Stars Grunge fabric from Moda Fabrics for her versions. It feels great to share these. I shipped them and the pattern off to APQ in May and I have had to keep my mouth shut about them since then. It was worth the wait though. The December issue hits newsstands next Tuesday, October 2nd. OMG OMG OMG!!!!! This is so awesome! But they're teeny...and that dreaded paper piecing technique...but congrats to you! How exciting - these look gorgeous in the smaller size! Congratulations!! How exciting. Those are adorable! CONGRATULATIONS! YOU REALLY MADE IT TO THE BIG TIME! The honor is well deserved! Can't wait for my issue to arrive in the mail! ---"Love"
Wow, That's exciting!!! I'll have to look for the magazine. Congratulations!!! Oh, I will be looking for this magazine, for sure! 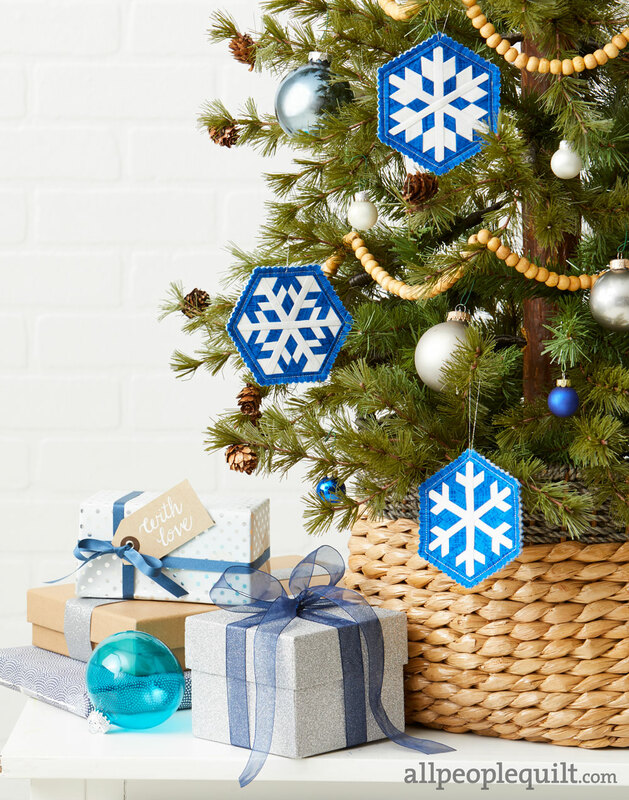 I have all of the large snowflake patterns, and even have the fabric I want to use to make them, but it hasn't happened yet. These look wonderful. Funny, but I just was looking at my snowflake patterns last week. Just love them. Thanks again for sharing them. Adorable! Congrats on being published. I have a secret project of my own going on...it is hard not to say or show anything. Wowzers, how cool is that, they are fabulous looking! What darling little snowflakes! Congrats on being a cover feature on a magazine! Woot! They are so cute in miniature. Congratulations on the publication. Congratulations Joanne. They are gorgeous. Well, I lost this comment twice; no clue what is happening to some of us who can't comment on blogs using gmail anymore... I am so tickled that you've made it a second time into the pinnacle (IMHO) of quilting magazines! Makes me think I need to get my Snow-Along snowflakes quilted up for this year! Those snowflakes are adorble and a perfect make for Christmas. I like your versions the best. Fast and Tidy is a win-win combination. Also the binding would make them heavier for ornament purposes. Pinking keeps them light. Less likely to topple the tree :-D Congratulations, Joanne. The cover is gorgeous!! !